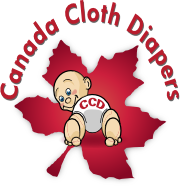 Earlier this week I was given the opportunity through Canada Cloth Diapers to review some Mama cloth from Pretty Eco Intimates. They are a new mama run eco-friendly business from right here in the Maritimes! Go East Coast! I love Canadian made products, but maritime products will always have a special place in my heart. She sent me 2 different sizes and absorbencies to try. I got an 8 inch liner and a 9 inch pad. I liked the 8 inch in particular for any back-up from my cup, and the 9 inch could definitely hold its own by itself. Not to mention they are super cute. I also like the adjustable snaps, it gives you a custom fit. Until now I have only used PUL backed mama cloth, but I must say I really like the microfleece backing. They are so comfortable, you can't feel them even in yoga or pyjama pants, it is easy to forget they are even there! I may be converted! When I checked out her site http://prettyecointimates.weebly.com, I found a really cool list of facts some of which surprised even me, and some great advice and info about her pads. Most women use approximately 11-13K disposable menstrual pads or tampons each during their menstrual years. This is devastating for both our planet and our pockets! There is a lot of awareness of the environmental disaster created by disposable diapers yet the problem with menstrual products is far greater and still needs to be addressed. Many women report allergic reactions to disposable pads, most likely caused by chemicals, bleaching residues and the plastic sheeting inside the pads. Tampon use can increase your potential for recurring yeast infections. Pretty Eco Intimates are washable, reusable menstrual pads, great for light to heavy menstrual flow, postpartum recovery, and bladder protection. Our pads come in two absorbencies and can be purchased individually, in multi-packs, or in starter kits. Pretty Eco Intimates have wrap around wings that snap together underneath your underwear, holding them in place. Each pad is sewn from 100% cotton or flannel topping with antibacterial, organic bamboo or zorb core, and a micro fleece backing. It you have a very heavy flow we also offer a hidden layer of PUL (the type of waterproof fabric that is used on many cloth diaper shells). Products containing PUL should not be repetitively ironed, as it will reduce their water resistance. After use…. just rinse or soak your pads in cold water, pop them in your laundry pail, and then machine wash and dry along with a regular load of laundry (just as you might treat underwear that had been leaked upon). Avoid high temperatures and avoid the use of softeners, whiteners or any other unnecessary additives. Not only has Natalia given me a chance to try her great product, she wants to get one of you hooked as well! 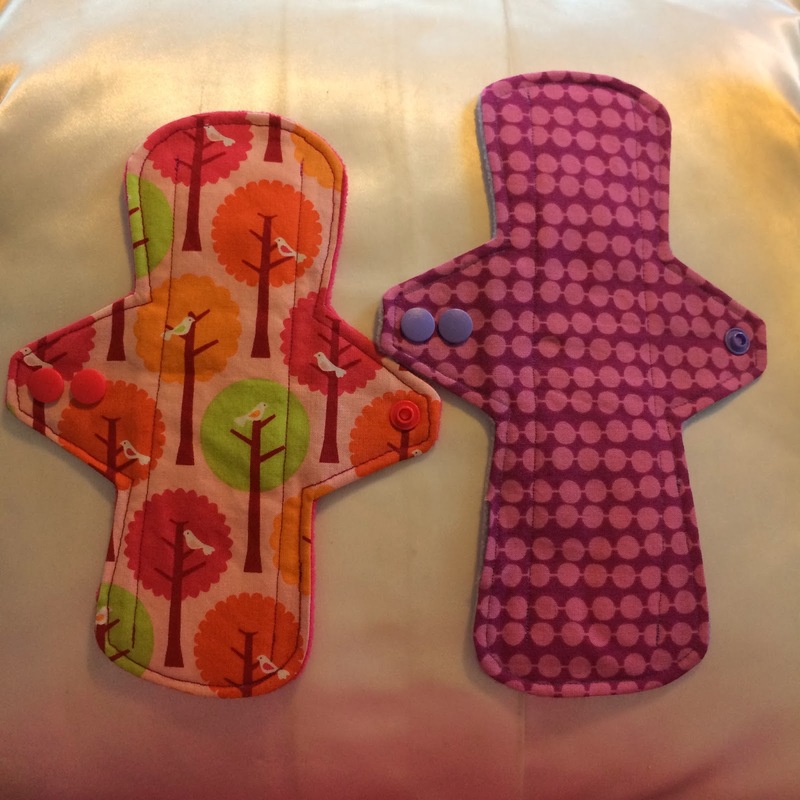 She is offering one pad from her shop to a lucky winner! Good luck all! I have tried the itty bitty liners she has (6 inch) and they work for light spotting but they are very little. I am going to get some 9 inch moderate pads next and I can't wait! So if I could win another 9 inch pad that would be great! I would choose a light 8" liner to wear with my menstrual cup. I would prob choose a 8" liner and a 12.5" heavy. 8" tends to be a good day time length for me. I would get an 8" pad. Thank you for the giveaway. I would pick the over night :) Great giveaway! i would choose an overnight! I would like the 8 inch liner. I just got done a TWO MONTH LONG period...I could use anything I can get! I only have two cloth pads right now! Those do sound like a great idea. It is amazing how many we go through in just a short period of time. Those are super cute. Love the patterns. They look like they can be very comfy. ive been thinking about trying these after my baby is born. I already use cloth diapers on my kids, it would be nice to get rid of one more disposable product. I'd be interested in the 14" overnight pad! No harm in it being too big and I'm always afraid of leaks in the back at night! I was looking through your blog and am impressed. The structure and content are both concise and vibrant. We here at festive health see you as a perfect fit to be one of the bloggers that we work with. 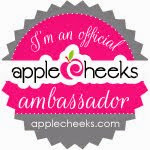 We provide additional exposure for a wide variety of bloggers. Festive Health is a website that offers customers all sorts of deals, freebies, and coupons. It offers ways for consumers to save on all sorts of products. We understand that living a healthy lifestyle can be a bit expensive. We created Festive Health with the vision of an avenue for consumers to shop for nutritional products at discounted rates. We establish personal relationships with every blogger we work and if it makes sense for both parties we can discuss a long-term partnership. Please email me back if you’re interested and would like to discuss further details.